Hosted by the Ann Arbor Transportation Authority, the meeting will bring together representatives of Washtenaw County’s “urban core” communities. It’s the next step in a process that began in the fall of 2012, when AATA’s effort to move toward a countywide transit authority was halted. Since mid-November 2012, the AATA has been working under the direction of an Ann Arbor city council resolution – passed on Nov. 8, 2012 – and has focused on planning improved or expanded services in the “urban core communities.” Those communities include the cities of Ann Arbor, Ypsilanti, and Saline, as well as the townships of Pittsfield and Ypsilanti. Superior Township and Ann Arbor Township might also become involved. 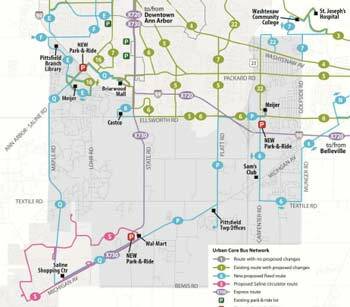 The March 28 meeting packet includes a description of core transit options or “themes,” with estimated annual new costs for each option starting in the year 2019: (1) sustaining current efforts – $180,000; (2) improving efforts within the existing AATA service area – $2.8 million; (3) expanding services to new areas – $3.6 million; and (4) enhancing current services while also expanding geographically – $5.4 million. Possible expansion into Ypsilanti Township, for example, might include: (1) new and extended routes serving residential and commercial areas, the Ypsilanti District Library and Ypsilanti Civic Center; (2) new ExpressRide service from the township to downtown Ann Arbor and the University of Michigan; (3) a new park-and-ride lot near Huron Street and I-94; and (4) township-wide dial-a-ride services for seniors, people with disabilities, and the general public, including connections to neighboring communities. 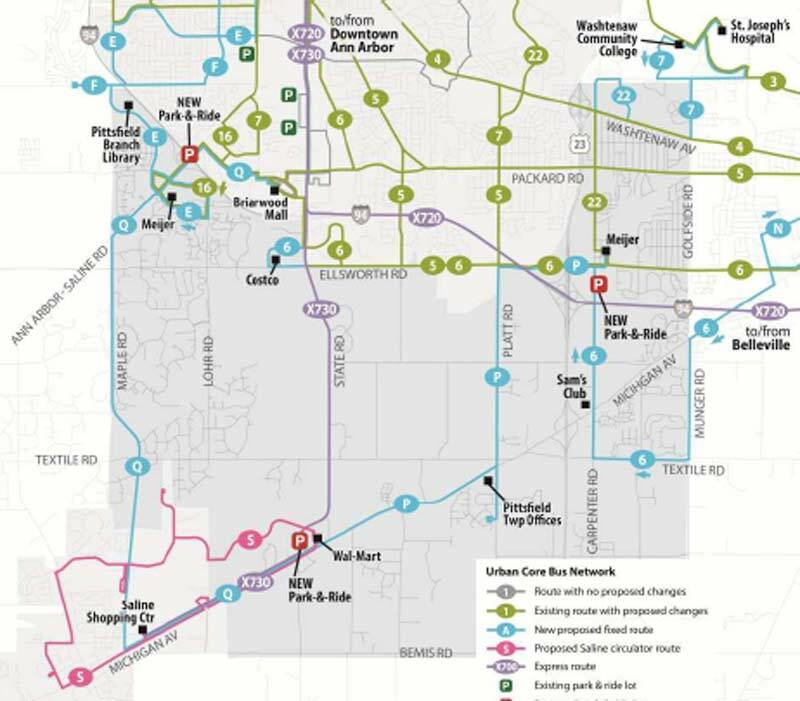 Improvements in the city of Ann Arbor include several possible route revisions/additions to the west side of the city, as well as additional improvements to the connections between Ann Arbor and Ypsilanti. The packet provides an estimated distribution of funding that could be needed from each community that’s involved, depending on whether that funding is based on the number of service hours or the population. The additional cost to Ann Arbor, for example, for just the improvements that are being contemplated within Ann Arbor would be about $2.4 million – if allocated based on service hours. In ballpark figures, Ann Arbor’s current transit millage is levied at a rate of just over 2 mills, which currently generates about $9 million. The $2.4 million for the set of possible Ann Arbor improvements could be nearly covered by an additional levy of 0.5 mills on Ann Arbor property owners. That rate is in the neighborhood of what a financial advisory group had previously calculated would be required to be levied countywide to pay for transit improvements throughout Washtenaw County. The 0.5 mills could be generated by asking voters to approve a new levy, or by asking them to override the Headlee Amendment, which has over the years reduced the transit millage from its originally authorized 2.5 mills to just over 2 mills. The goals of the March 28 meeting, according to the agenda, are to reach consensus on a service plan “theme” and to establish two working sub-groups, for finance and governance. The meeting will also address a financial analysis, a benefit analysis, and responses to sidebar issues raised by elected officials over the past few months. The meeting, which is open to the public, will start at 5 p.m. at the Pittsfield Township Hall, 6201 W. Michigan Ave. At the AATA board’s March 21 meeting, CEO Michael Ford reported that Daniel Cherrin from North Coast Strategies will provide pro bono facilitation on March 28.